The Rose City Halter Dress is a classic style that is sure to be wardrobe worthy for years to come. If a vintage style is what you are after, sew it up in a gingham, a plaid or a ditzy print. For a more modern approach, use a black luxurious fabric for a stylish cocktail dress. This pattern is very versatile and timeless. The design features a lined, fitted bodice with invisible side zipper, a V-neckline, halter neck ties and a hemline that falls just below the knee. Version A features a gathered skirt with in-seam pockets. This skirt has a flat hem suitable for stripes, borders and plaids. Version B features an A-line, bias skirt with curved patch pockets. 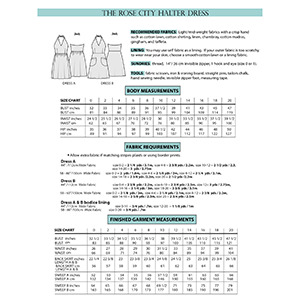 This pattern is considered advanced beginner or intermediate level due to the bodice being very fitted. For best results, it is advised to make a muslin bodice and make fitting adjustments before sewing in actual fabric. 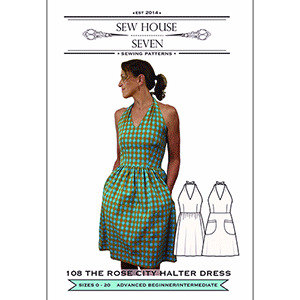 This is an intermediate beginner level sewing pattern. Suggested fabrics are cotton jersey, specialty wovens, and light to mid-weight fabrics with a crisp hand.